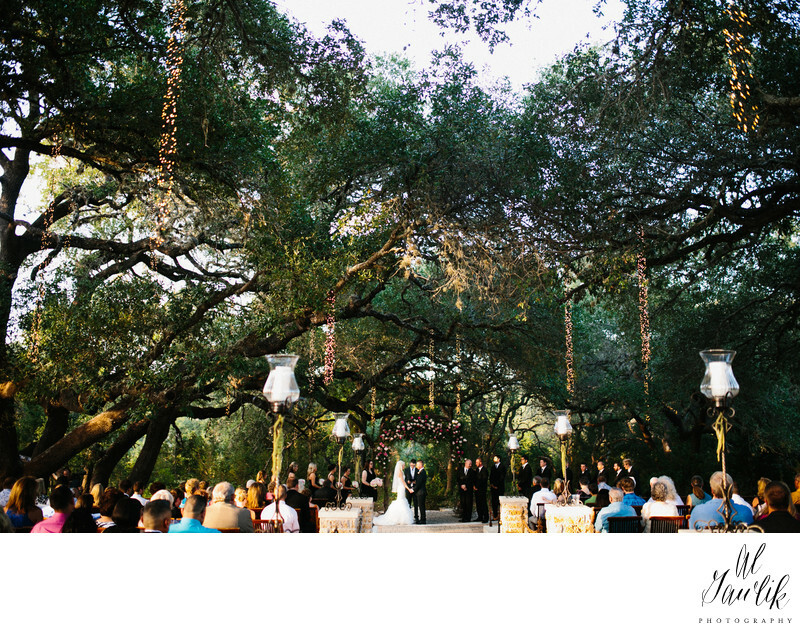 Twinkling lights and romantic charm defines Sacred Oaks as the premier Hill Country Resort venue in Dripping Springs, Texas. The Sacred Oaks site on Camp Lucy, a Texas ranch in the hill country that was turned into an event locale and now the premier Texas wine country resort, is a recent addition to the property completed in September of 2013. Dripping Springs is a charming small town community in the Hill Country located about half an hour west of Austin, TX, and 45 minutes north east of San Marcos, TX. The town of Dripping Springs is becoming an ever popular get away, attracting event planners and especially those looking to hold their wedding celebrations in an accessible, though beautiful rural setting. Set among the stately presence of a dramatic backdrop of illuminated oak trees, the venue boasts an elegant array of facilities suitable for the largest of wedding parties. Included are waiting rooms with restrooms for the bride and groom. There is plenty parking space making the site conveniently accessible to large parties. There is ample room for up to 350 of your friends, family and their companions to witness your ceremonial union and then enjoy the festivities and comradery in spacious spans of green lawns. Your guests are also sure to enjoy the mystical feel of shaded canopies in the surrounding groves. Catering is available on site and the eclectic menu options designed by top chefs are ready to appeal to any preference and provide a fantastic dining experience for you and your guests. The “Great Hall” is an impressively conceived structure framed in large natural timbers. It is an open and elegant expanse complete with an integrated bar that is sure to win over your personal tastes and exceed your expectations! Photography options are virtually limitless. Group shots among natural stone and timber architecture, intimate captures of individuals as they wander through the evening lit groves in their formal wear or children playing and running about the foundation of the soaring bell tower on the day of your momentous occasion will provide memories that last a lifetime. Camp Lucy also offers on-site lodging for family and friends with a world class destination restaraunt and bar, Tillie's. A refreshing pool with swim up bar and wood fired stove also provides guest a luxury hill country experience all in one location.